Tax-inclusive pricing is designed for regions with tax calculations that have a requirement for tax-in totals. NOTE: Unless you are in such a region, do not use this option. 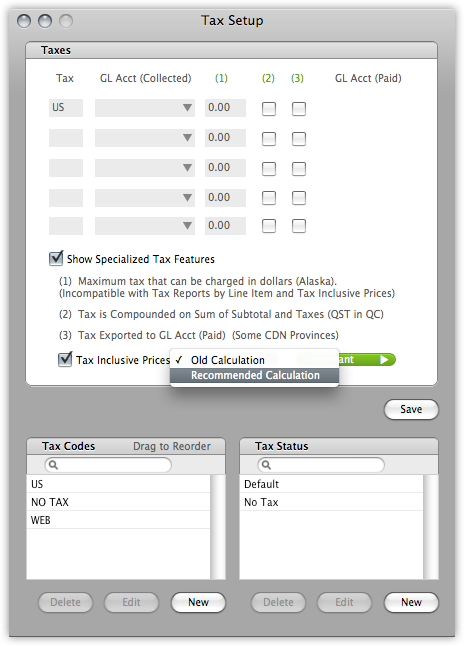 OnSite's Tax-Inclusive Pricing (TIP) displays all prices with the default tax code already applied. For example, if a retailer’s default tax code applies a 10% tax to all products, a product priced at $100 appears as being priced at $110 with tax-inclusive pricing enabled. When you use TIP, both prices appear on the product card. However, on documents, only the tax-inclusive price is displayed, while the sub-total, tax breakdown, and totals will appear as they do not use TIP. NOTE: You can set either the tax-out or tax-in price for a product in one of two ways. The first way is that in the product card you can click the Selling Price field, which calculates the Tax-Inclusive Price using the default tax code, or you can click the tax-in price to calculate the regular selling price. The second way is that you can use Set Selling Prices to set either the regular Selling Price or the Tax-Inclusive Price. In Onsite go to Tools > Setup > Basics > Taxes . Click Show Specialized Tax Features > Tax Inclusive Prices. 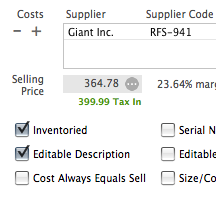 Makes OnSite calculate tax inclusive prices for all of your products that can be adjusted in the Products windows. To change the tax inclusive selling price, click the green tax inclusive price to set a new one, which back-calculates the selling price before taxes. You can also import tax inclusive selling prices using Import Tools. In OnSite StoreMaster on the Tools menu click Import Tools > Import Products and select Sell (Tax In). This feature also calculates totals on documents using Tax Inclusive prices and reverse calculates the taxes and subtotals. The Tax Inclusive prices are shown on-screen and on print outs. Discounts are calculated on the Tax Inclusive price. Searching for Products in the Browser and in other Product searches throughout Lightspeed OnSite shows Tax Inclusive prices. Previews of documents in the Browser also show Tax Inclusive prices on line items, just as they are shown when the document is open. You can also use Tax Inclusive Prices in Set Selling Prices to do batch pricing changes based on the tax-inclusive amounts. Reports and exports of documents display the pre-tax prices of line items. Subtotals are tax-exclusive, and totals are tax-inclusive.